Sacha joined the Centre for Research on Children and Families in April 2009 as research assistant on the CIHR-funded Pan-Canadian program of research entitled Parenting Matters! The Biopsychosocial Context of Parenting Children with Neurodevelopmental Disorders (NDD) in Canada. Sacha is involved in two of four concurrent projects on the Parenting Matters! team: a systematic literature review of observational studies of parenting children with Neurodevelopmental Disorders (NDD) and as research coordinator of a multi-method, multi-site clinical study of parenting children with NDD. Sacha is a doctoral candidate at McGill University, School of Social Work. Her doctoral project, which focuses on the experience of hope among parents of children with NDD, is funded by the Fonds de Recherche du Québec en Société et Culture (FRQSC). 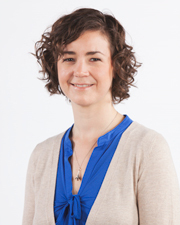 Sacha came to social work graduate studies with several years of experience working on the community and employment integration of adults with intellectual and developmental disabilities. Her clinical practice also includes working with families of children with Autism Spectrum Disorders at multiple stages of the service continuum. Her research and clinical interests include the quality of life of parents and children with developmental disabilities, parenting, hope and resilience, access to services, and knowledge translation in rehabilitation contexts.